Your WordPress website will never be out of sync with your 1ShoppingCart.com prices ever again. 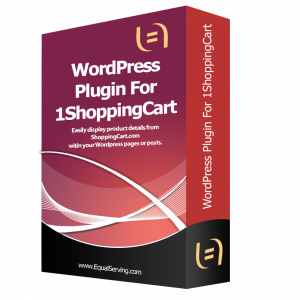 Get our WordPress Plugin for 1ShoppingCart.com today! Buy Now – Only $34.95! The plugin comes installed with five (5) responsive product list templates to choose from. All five (5) responsive templates are coded with Rich Snippets for Products (Schema Markup). We have created a video that demonstrates how easy it is to install and configure the 1ShoppingCart.com Plugin for WordPress on your WordPress site. The step-by-step installation video is only 13 minutes long. You’ll see you can have your site up and running in less than 30 minutes. Watch the video now! Click to watch configuration video. Worried that you won’t know how to configure the plugin? Don’t worry – we have an extensive knowledge base that will answer every question you might have. We have also included a video that walks you through the configuration process. Once you make a change in the 1ShoppingCart.com administration panel, the price, name or description change are reflected on the website. The configuration of the plugin is easy to perform. We have produced a video screencast that will walk you through the configuration process. The product details and product listings can be displayed in any format you desire to conform with the look and feel of your website. Display certain content only when a product condition is true. For example, display a text or image when you have checked the Enable Sale Price option in 1ShoppingCart or checked the Featured option. Using Shortcodes, product details and/or product listings can be displayed on a page or a post. The plugin’s shortcodes allow for attributes that make the plugin flexible for any website. An extensive knowledgebase has been created to ensure that you are able to use the plugin effectively. You can view the knowledgebase here. Excellent Customer Service I am very grateful for the work and performance of the premium 1ShoppingCart plugin. You have done an outstanding job with it, letting us seamlessly integrate our 1ShoppingCart products into our WordPress website. I strongly recommend the plugin and your services to all that use 1ShoppingCart.com and have a WordPress website! Thank you again! This Plugin ROCKS, it just made the development of simple eCommerce portals into WordPress even Cheaper !!!! This allows me to build and expand our eCommerce site collection even faster than we already have been. This is a mandatory expansion for any word press developer that wants to build a quick and efficient eCommerce portal. Great Plugin for 1Shoppingcart and WordPress! Running an external cart avoids all the security hassles and integration in WordPress, but being able to handle products, Pricing, descriptions, catalog etc. use to be difficult. Now my clients can use this to easily add shopping cart products and functionality anywhere on their site. Excellent support makes it the perfect fit! I highly recommend Equal Serving and the WordPress Plugin for 1ShoppingCart.com Plugin.